ოსკარ აიზეკ ერნანდეს ესტრადა (ცნობილი, როგორც ოსკარ აიზეკი, დ. 9 მარტი, 1979) — ამერიკელი მსახიობი და მუსიკოსი. იგი ცნობილია ფილმებში „ლუინ დეივისის შიგნით“ და „მანქანიდან“ განსახიერებული როლებით. 2015 წლის ფილმში „ვარსკვლავური ომები: ძალის გამოღვიძება“ იგი ასრულებს პო დემერონის როლს. შეგიძლიათ იხილოთ მედიაფაილები თემაზე „ოსკარ აიზეკი“ ვიკისაწყობში. ↑ Shoard, Catherine. Oscar Isaac: 'The irony is not lost on me. Being celebrated for playing someone who wasn't' (2013-05-23). წაკითხვის თარიღი: 2015-04-04. 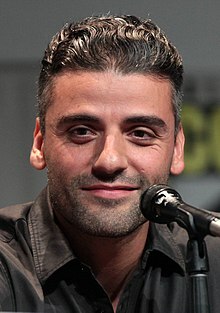 ↑ Oscar Isaac says he can relate to 'Llewyn Davis' character | abc7.com. Abclocal.go.com (2013-12-05). წაკითხვის თარიღი: 2014-03-07. ↑ Oscar Isaac Had A Most Excellent Year. The Huffington Post. წაკითხვის თარიღი: 5 April 2015.